Editor’s note: Candace Oehler, affectionately know by a number of Latino baseball players as “La Veterana,” has been around the game in Seattle and Phoenix since the 1990s. On the surface, it’s an unlikely friendship – a 53-year old former clutch hitting Venezuelan infielder with five World Series rings over a 13-year MLB career; and a 32-year old California-born starting pitcher still working hard to get back to the majors for the first time since 2013. But Luis Sojo and Barry Enright are not really such an odd couple. The current manager of the Aguilas de Mexicali and the Scottsdale resident both return year after year to manage and pitch, respectively, in the Liga Mexicana del Pacífico (LMP). They represent opposing winter ball teams, but enjoy a friendship that grew when Enright spent the 2016 season with the Sojo-managed Toros de Tijuana in Mexico’s other major league, the Liga Mexicana del Beisbol (LMB). They share a passion for the game, sarcastic bent, iconic facial hair and a deep appreciation for what Mexican baseball gives them. The two recently reunited at the Mexican Baseball Fiesta, held at Mesa’s Sloan Park last month. The three-day Fiesta featured pre-season games between LMP rivals Naranjeros de Hermosillo, Aguilas de Mexicali, Cañeros de Los Mochis and Yaquis de Ciudad Obregon. A sea of orange greeted the Naranjeros, who with 16 championships are the Yankees of the LMP. Their ardent fans travel to away games, are scattered throughout Mexico and the U.S. and expect a winner every year. 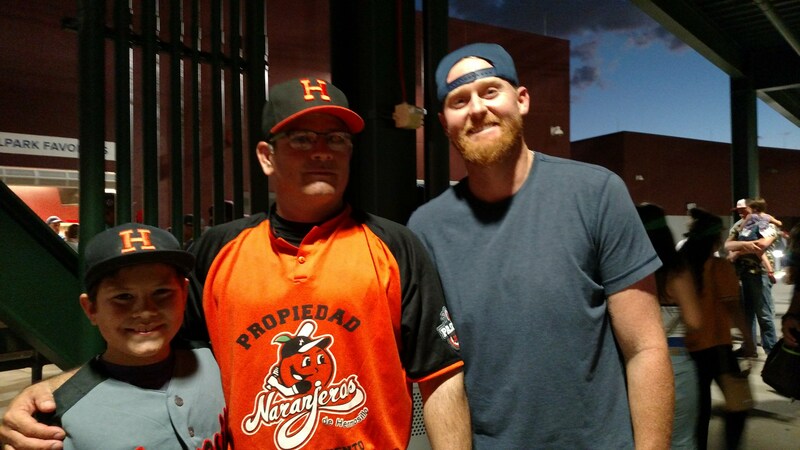 Enright, who has five seasons with the Naranjeros under his belt, including a Most Valuable Player award from the 2013-14 championship (Hermosillo’s last), was thrilled to hang with his Hermosillo teammates and coaches again. Reconnecting with Sojo was an unexpected bonus. Sojo recalled meeting the tall redhead three years ago in Hermosillo and was pleased to find him on the starting rotation for the Toros in 2016. The man who became known as “Canelo” or “Barba Roja” pitched 127 innings for the Toros that season, and finished with a 10-5 record and 3.19 ERA. “He’s a guy who wants to be on the mound , he’s very competitive, very professional,” he said. He went on to describe their unique relationship. But the good-natured banter is based on mutual respect, and Sojo can’t say enough about Enright’s value to a team. The well-traveled right-hander, drafted in 2007 by the Diamondbacks, had Major League stints with Arizona in 2010 and 2011 and the Los Angeles Angels in 2012 and 2013. His most successful season was 2010 when he started 17 games for the D-backs and went 6-7 with a 3.91 ERA. After 2013, he was signed by Philadelphia, the Dodgers, San Diego, Colorado and then was re-signed by the Diamondbacks as a free agent in July 2018. After four major league seasons and 10 seasons in the minors, he found himself experiencing a crisis of baseball faith. At AAA Albuquerque he was approached by Derek Bryant, a Naranjero GM in charge of imports. He asked Enright if he’d like to come down for the 2013-14 season. “I was open to it. My career wasn’t going bad at that time, but I felt that I had unfinished business and going into free agency wanted to show people that I could do a little better than the season showed,” he said. More important than that, he believes that a higher power had plans for him. “God put me in the situation and brought me down there. I truly believed He would bring the life back into me,” he explained. And what a season it was. The Naranjeros won the championship and Enright’s 2-0 finals record earned him the MVP trophy. The passion and dedication of the fans was on full display that season, and Enright was stunned by the playoff atmosphere, pitching in front of standing room only crowds exceeding 30,000. He won Games 1 and 5, and found himself carried around the stadium on the shoulders of fans when the Naranjeros closed it out in Game 7. “It was pretty cool and pretty special,” he recalled with a smile. A walk around the Sloan Park concourse with Enright is like being in the presence of a rock star. Fans come up to him from all sides, greeting him with shouts of “Canelo!” snapping selfies and shaking his hand. He obviously holds a special place in their hearts. He still laughs about his expectation that Mexican baseball would be like an episode of Eastbound and Down, with Barry Enright playing the part of Kenny Powers. Instead, he found himself in Hermosillo’s Estadio Sonora, a state-of-the-art stadium that draws 15-18,000 fans a night. He pitched opening night in the new stadium and still says it was like nothing he’d ever experienced. His nine foreign seasons (two in Venezuela, seven in Mexico) and a 29-18 record make Enright not only an expert tour guide, but the guy you want to go to for advice if you’re thinking of playing in the Mexican winter league. Enright is on the 2018-19 Hermosillo roster, but unsure whether he’ll return for a sixth season with the team. It gnaws at him that the Naranjeros have gone four years without a championship, and he doesn’t feel right about ending his Hermosillo career without another one. But the downside of going back is pitching so much, logging 250-260 innings in combined winter league and the US season. It makes him feel like he’s pitching every summer season at around 80-85%. But, no matter what decision he makes, it’s unlikely that Enright will lose that passion for the game that the people of Hermosillo helped him find again. In a perfect world, he and Sojo will face each other in the LMP championship, and the barbs will fly once again.